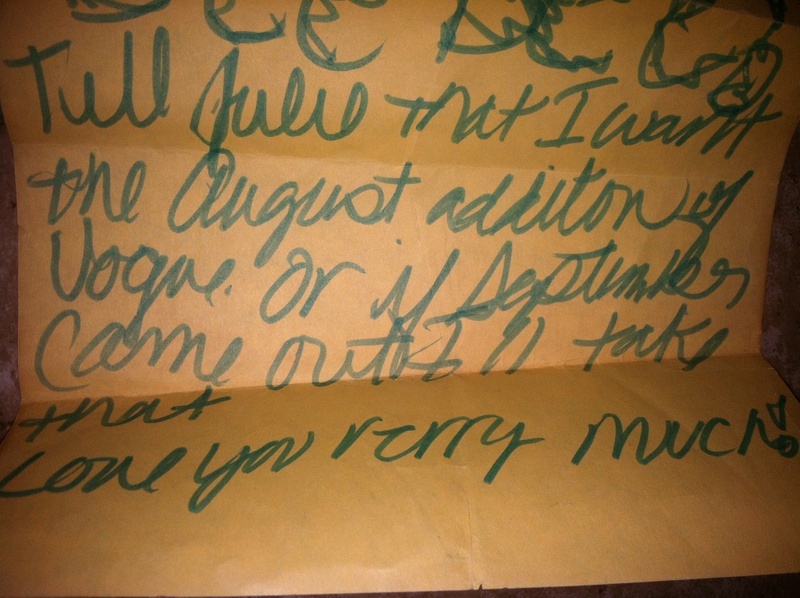 Yesterday my BF sent me this picture of a letter that she found from 1979. She had written it to her mother while away at camp. I hated it when she left for camp, it was only for a week but it seemed like a lifetime. And since none of the other neighborhood kids were interested in anything like fashion magazines or singing Broadway musicals, I was forced to entertain myself (that’s when I learned all of the words to “A Star is Born”, but that’s another story). I remember promising her that I’d write her every day about what happened with Luke and Laura on General Hospital and keep her posted on who was on the cover of the next month’s Vogue. I love that she still has this letter and I love how she wanted the “addition” not the “edition”. Such great memories. PS This is the 1979, August issue featuring Kim Alexis. When I was growing up, it was cool to get as burned and tanned as possible. My friends and I would slather baby oil on our skin and lay on tin foil so we could attract the sun’s harmful rays quicker. WTF? Where were our mothers? Oh, I remember now, they were “laying out” too, but they used Bain De Soleil for the “San Tropez tan”. We weren’t allowed to use that because it was expensive (but we sneaked it anyway). And back then, it wasn’t common to talk about skin cancer and the damaging effects the sun had on your skin, we just wanted to see whose tan line was darker. But today, just 20 minutes in the sun without protection will get me a few new freckles and lines. I carry a tube of sun block in my handbag at all times and now that we’re heading into the summer months, my favorite cover-up is a big floppy hat. They never go out of style, they protect your face from the blistering heat and they are fashionable. Hats off to you for protecting the only skin you’ll ever have! P’Trique (the cross dresser with a beard) is becoming more famous every day with his hilarious videos about fashion and beauty. And since Charlotte Free just landed a partnership with Maybelline as their new poster child, P’Trique decides to tell all. After promising Charlotte that he can keep a secret, he picks up his pink, dial phone and calls Betsey Johnson (and the rest of NYC). This video made me laugh, it’s worth the view. I hope everyone has a great and stylish day. Oh, and a big congratulations to Charlotte Free, the Roadkill Girls love you! Here’s my Vlog for the week. It’s all about my obsession with visual merchandising at Roadkill Ranch & Boutique. I hope you enjoy it and are inspired to create. Gwen Stefani’s children’s clothing line, Harajuku Mini, was so successful the first time around for Target, she’s doing it again! The superstar (and L.A.M.B. creator) draws her inspiration from Japan’s extreme, street culture in the Harajuku District, and the new designs are just as cute as the last batch. 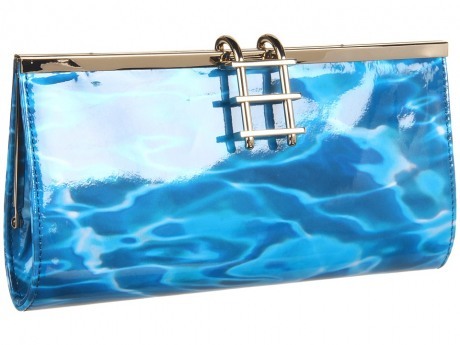 She features bold colors, large logos, and animated looks with lots of stripes, plaids and graphic prints. And according to Gwen, the deliveries aren’t stopping any time soon. The new collection is due to hit the stores by the end of this month. It’s “No Doubt” Target can’t get enough! 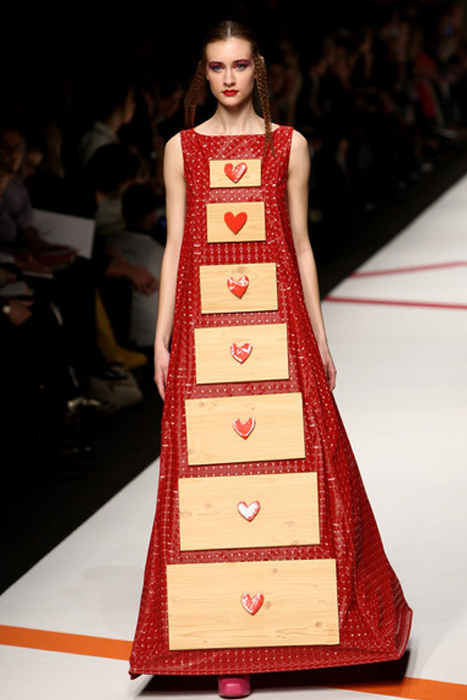 Here’s my “Freaky Friday Fashion Frock” for the week by, Agatha Ruiz de la Prada. I think she misunderstood the mission. Someone at the fashion show probably said, “Hurry! Dress her!” (referring to the runway models) and she thought they said, “dresser”, so she gathered some wood from back stage and hot glued it to the front of this gown. I hope everyone has a great weekend. Stay creative! Scarves are an instant wardrobe update. They’re easy and fun to wear, so I decided to Vlog about them this week. Tie the knot? Don’t tie the knot? The choice is yours, and since scarves are relatively inexpensive, don’t feel like you have to be married to one look. Mix it up and play around! When Joey Wolffer (the former Trend Director for Jones Apparel Group) saw a need for bringing amazing designers and one-of-a-kind pieces to the US, she never imagined that she’d be trucking them in. Literally! Joey took a twenty-foot potato chip truck and refurbished it into a luxury boutique on wheels. She wanted to bring her hand-picked treasures to customers through a unique and personal shopping experience. 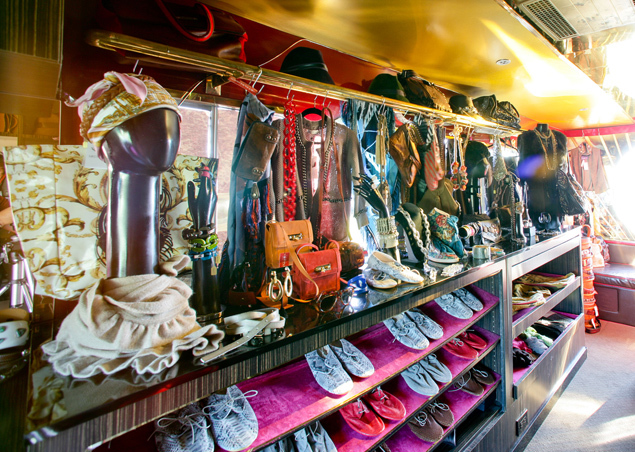 She figured if the food trucks could do it, then she could do it too with fashion, and hence; the StyleLiner was born. She is based out of New York in the Meatpacking District but travels all over the US. Steve Jobs would have been proud of her “Think Differently” approach.